While Crusaders and Linfield dominate the betting markets for this season’s title race, Sean Ward reckons Glenavon deserve to be touted as genuine challengers. The Lurgan Blues bolstered their ranks during the summer with a number of shrewd signings, not least the marquee capture of Northern Ireland international Pat McCourt. Gary Hamilton’s men have enjoyed a positive start to the season, winning twice and coming from 3-0 down to draw against Ballymena United. Last week’s late show against Cliftonville highlighted the character in Glenavon’s ranks, and Linfield midfielder Ward believes last season’s Irish Cup winners will be in the title mix come next April. “Glenavon are genuine title challengers. They have to be,” Ward said. “They have shown a lot of character already this season. From 3-0 down against Ballymena to their late win against Cliftonville. “Glenavon have certainly strengthened, and Gary (Hamilton) has always had that knack of dipping into the market and signing some hidden gems. And also attracting known players like Paddy McCourt to the club. Glenavon defeated Linfield in last season’s Irish Cup showpiece, denying Ward of lifting a major trophy with the Blues. Their last league success came back in 2012, the same year they last lifted the Irish Cup. “The title is the one we want. That is the same every year,” Ward admits. “The pressure and expectation is always there, and we are constantly reminded of how long it has been since we won the league. The Blues are also unbeaten this season but have failed to sparkle in their three games to date. 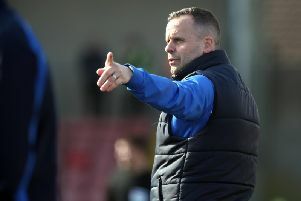 An opening day win at Ballinamallard United was followed by a contentious draw against Coleraine. There were positive signs in last week’s draw against champions Crusaders, however, with David Healy’s side securing a deserved point after being reduced to 10 men. “When you come to Seaview and go down to 10 men with 40 minutes to go, you have to prove your character. And we did that,” Ward added. “The draw against Coleraine was disappointing. We maybe sneaked a point in that game, but we deserved at least a point against Crusaders. “If we had kept 11 players on the pitch we might have come away with a win.